Another bold new era begins! This strip is written, drawn, and colored by D.F. French. It's a faithful recreation of a strip he did years earlier for our high school newspaper. 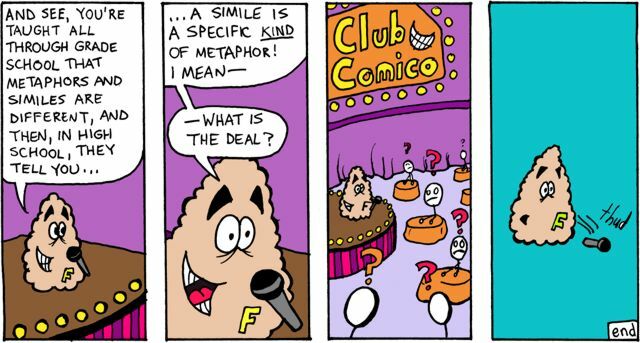 At this point I had been writing and drawing the F&S strip for years, and was ready to take a break. D.F. agreed to take over, after a transitional period. This is the beginning of the transitional period. This is also where the strip switches over to color. I'm still conflicted about that decision, because I like how the black and white looks, and because many of our early color strips are hideous, but it was fun to try something new. I really dislike this color for Fuzzball--it will change soon--but I like the coloring in this one overall. Cute little comic.....I like it!